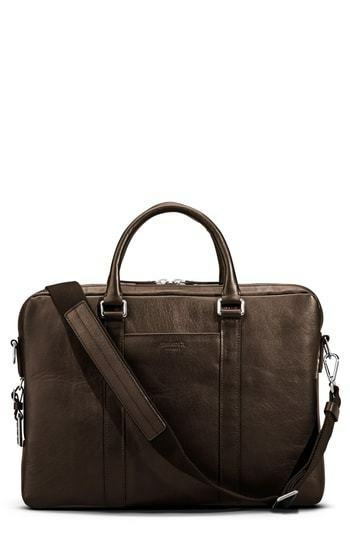 If you prefer comfort dressing when it comes to fashion, you'll love this neat combo of a charcoal blazer and a dark brown leather briefcase. 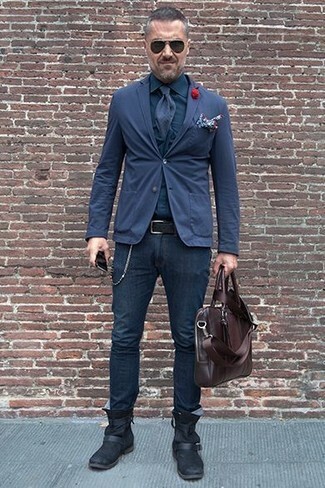 Add navy suede desert boots to your look for an instant style upgrade. 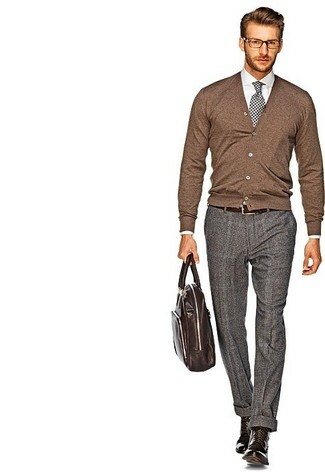 Dress in a brown cardigan and a Shinola signature leather computer briefcase if you're searching for an outfit idea for when you want to look casually cool. Kick up the cool of your getup by completing it with brown leather casual boots. 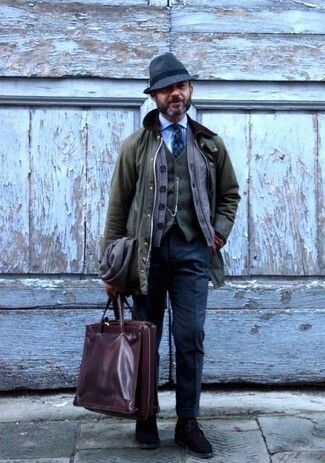 We're all getuping for comfort when it comes to dressing up, and this combination of a dark brown plaid barn jacket and a Shinola signature leather computer briefcase from Nordstrom is a practical illustration of that. 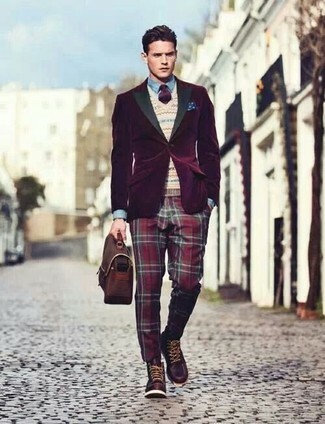 Channel your inner Ryan Gosling and throw in a pair of burgundy leather brogues to class up your getup. Team an olive barn jacket with a Shinola signature leather computer briefcase, if you feel like relaxed dressing without looking like you don't care. Bring instant interest and excitement to your look with dark brown suede desert boots. If you prefer practicality dressing when it comes to your personal style, you'll love this easy combination of a dark purple velvet blazer and a Shinola signature leather computer briefcase from Nordstrom. Choose a pair of dark brown leather casual boots to kick things up to the next level. 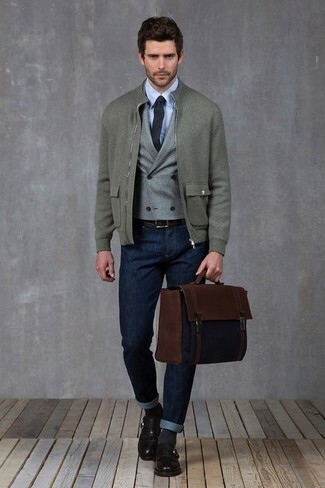 Pair a navy cotton blazer with a Shinola signature leather computer briefcase from Nordstrom if you're in search of an outfit idea for when you want to look casually cool. Up the cool of your look by completing it with black leather chelsea boots. 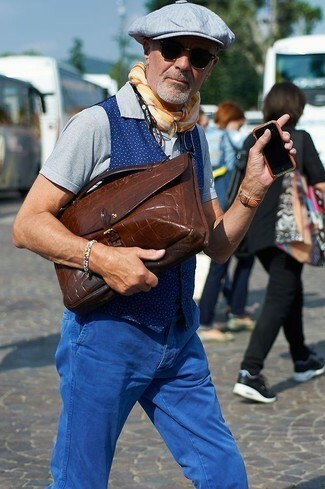 If you're on a mission for a casual yet sharp outfit, reach for a blue polka dot waistcoat and a Shinola signature leather computer briefcase. Both pieces are totally comfortable and will look great paired together. For a comfortable-as-your-couch outfit, reach for a grey wool bomber jacket and a Shinola signature leather computer briefcase. You could perhaps get a little creative when it comes to footwear and dress up your getup with black leather monks. 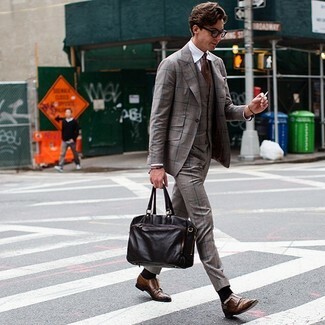 If you prefer a more relaxed approach to fashion, why not try teaming a brown plaid three piece suit with a dark brown leather briefcase? 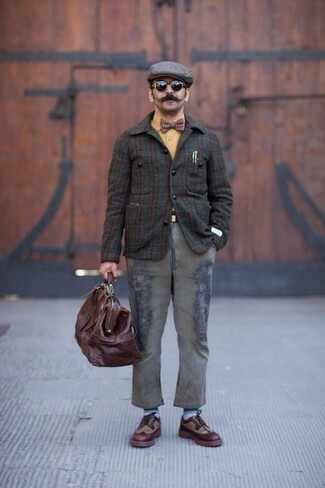 Wearing a pair of brown leather double monks is a simple way to add some flair to your look.